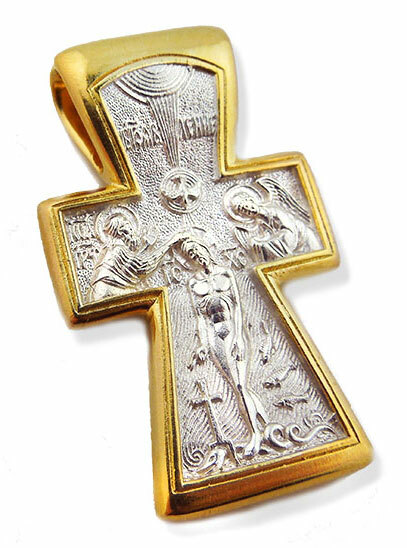 Description: Sterling Silver 925, 22 KT Gold Plated Orthodox Reversible Cross with Baptism and Crucifixion. Cross with extending ends of a vertical beam. The form is characteristic for the wooden crosses widely widespread in XVII-XVIII centuries in Russian North. The face sheet: the Epiphany or the Christening of the Lord in Jordan. The back: the Crucifixion on a background of the Jerusalem wall with forthcoming Mother of God and John Bogoslovom.